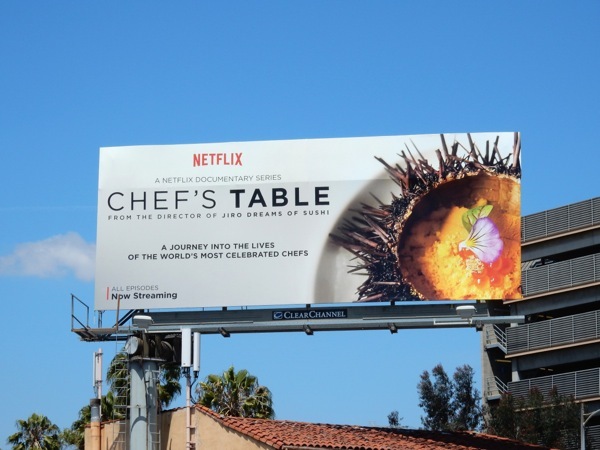 In recent years, the subscription streaming service Netflix has not only made a name for itself with such high-profile, binge-worthy original series like House of Cards and Orange is the New Black, but it has also also become a real destination for documentary films and series. 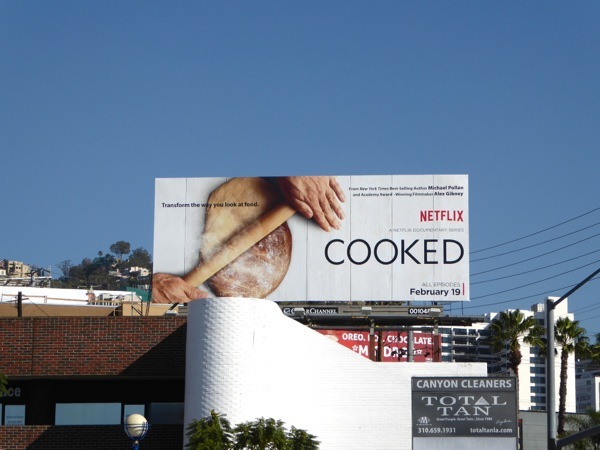 Two such shows which have explored the tantalising world of food are the recent Cooked series and last year's Chef's Table. 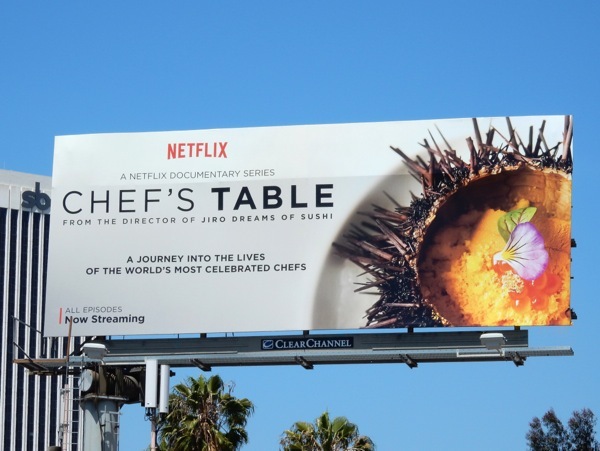 The beautifully shot Chef's Table delved into the passions, motivations, success stories and egos of celebrated chefs and restauranteurs in each of its six episodes, including Massimo Bottura, Dan Barber, Francis Mallmann, Niki Nakayama, Ben Shewry and Magnus Nilsson. 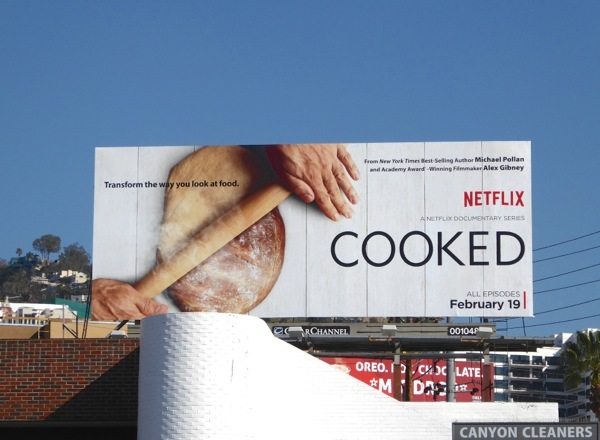 Meanwhile the four episodes of Cooked by acclaimed writer Michael Pollan is less about the cuisines and how it looks and tastes, and surprisingly more about the techniques used when cooking food across cultures and generations using the elements of fire, water, earth and air. 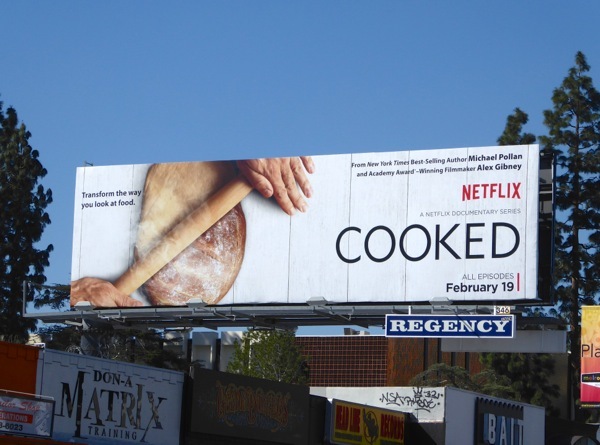 The series premiere billboards for Cooked, which really make you think this is more of a baking show, were spied above Santa Monica Boulevard and along Melrose Avenue on February 19, 2016, whilst the visually striking launch billboards for Chef's Table were spotted high above San Vicente Boulevard on May 20, 2015. 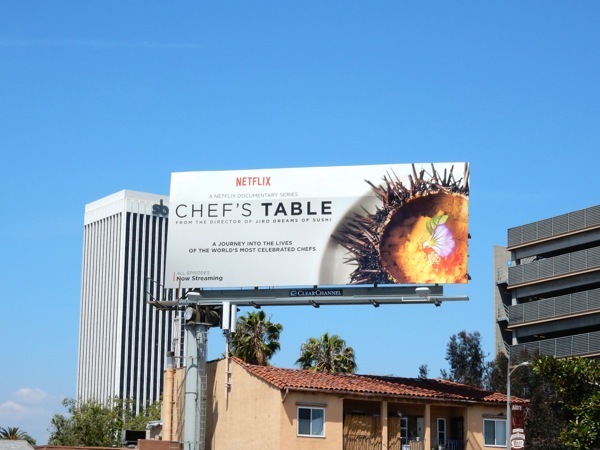 The reality TV aficionados amongst you will also enjoy these Holiday Baking Championship billboards and Top Chef billboards, whilst the foodies out there should also check out these other food-themed billboard ads that have filled the city skyline in recent years. All of a sudden, with all this talk of food, restaurants and cooking we're feeling mighty peckish here at Daily Billboard, what about you? 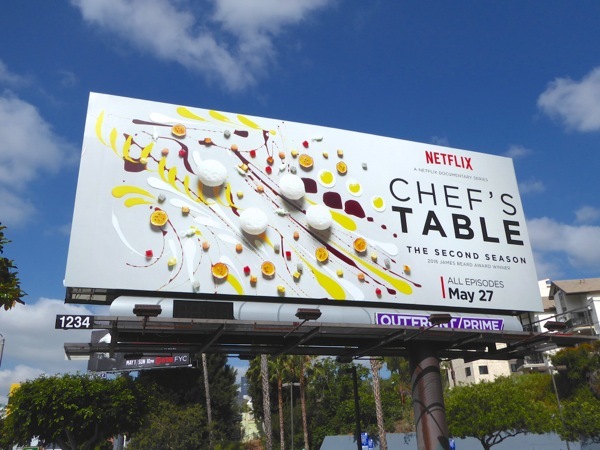 UPDATED: Here's also the mouth-watering second season billboard for Chef's Table, which resembles an artist's paint palette, was snapped along the Sunset Strip on May 26, 2016. 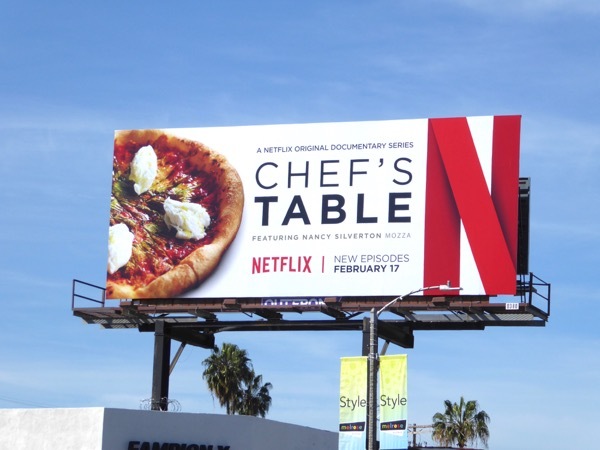 UPDATED: Here's also the third season billboard for the Netflix docu-series, photographed along Melrose Avenue on February 13, 2017, which coincidentally is just a few blocks from the featured chef, Nancy Silverton's Osteria Mozza restaurant.